That’s how Neal Ruhl, Director of Broadcasting at Oakland University, described the school’s new ScoreVision jumbotron system. Oakland University is a Division I university situated in Rochester, Michigan, a suburb of Detroit. The campus hosts about 20,000 students and has a variety of programs, with men’s basketball as their premiere sport. But with outdated video displays and metal box scoreboards that were original to the facility, it was time to upgrade the Golden Grizzlies’ O’rena. Now, the athletics department has even more to be proud of. Check out this quick video to see why Oakland University upgraded to ScoreVision! In addition to modernizing their LED jumbotron system, Oakland University has received an upgrade in the simplicity of producing their events and in the customer service they receive. Just ask Leanne Schnurer, Director of Game-Day Experience and Fan Engagement. She’s responsible for coordinating and producing every sporting event that takes place in the O’rena. ScoreVision is proud of our partnership with Oakland University and we look forward to our continued relationship with this school and all of our customers. 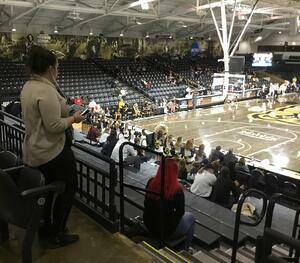 To see photos from ScoreVision’s ESPN debut at Oakland University, check out our blog here. Stay tuned for more information about features and customer testimonials right here on our blog and follow us on Twitter, Facebook, and subscribe to our brand-new e-newsletter to be the first to know when these stories are released! ScoreVision brings the professional arena experience to high schools, colleges, and sports facilities of any size with our affordable, easy-to-use jumbotrons and production software. Learn how you can bring ScoreVision to your school by contacting us today.